Gaming with Coin: The Most Exciting Event of the Whole Game! The Most Exciting Event of the Whole Game! Wow, the past week has been very busy indeed with a decided lack of gaming as well as posting. To keep up the flow I'll post a humorous gaming anecdote from the world of Medieval II:Total War. 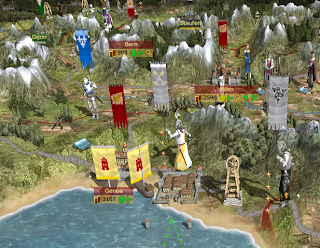 First time I played the game, which was after all the patches had been released, I decided to play on medium/medium as I had heard that the AI had been improved since Rome: Total War but still received considerable bonuses for the units in combat space. After realising that I didn't really fancy playing any of the factions available at the start I signed up for a Short Campaign as the proud city state of Venice as it's bang in the middle and thus surrounded by states to interact with. Having a small empire to start with would allow me to get to grips with all the new concepts before being severely challenged by internal and external strife; I remember all to well the rebellions that could explode in the face of the Holy Roman Empire in the original Medieval: Total War, or the Western Roman Empire in Barbarian Invasion, the Rome-expansion pack. Besides, it would be very interesting to see if the Creative Assembly had retained the over powered Italian Infantry unit. As I start playing the game I realise how utterly dreadful the AI actually is. I will not go on a rant about that though, the faults of the game have been listed at great length by others in other places. The interesting bit came after I had invaded Genoa and Florence: Being allied with the Papal State, the Pope and his armies had right of passage in my lands. The Pope used this liberally and sent a large stack of units north and west towards France. However, on the way there his got stuck outside Genoa and turned back towards Rome. On the way to Rome the army got stuck outside Florence and thus turned towards Genoa again. This sequence of events repeated every turn, regular as clockwork: 1 turn, move to Genoa, get stuck, 1 turn, move to Florence, get stuck. Now, what could be the cause for this constant patrolling? 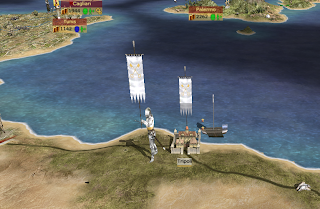 Did the Pope believe the coast between these two great cities to be infested by bandits? Was the general mad? Maybe he lived a double life, with a wife in each city? Unfortunately, the world will never get an answer as the Most Exciting Event of the Campaign happened, after about 60 turns of patrolling. On the horizon, a ship! 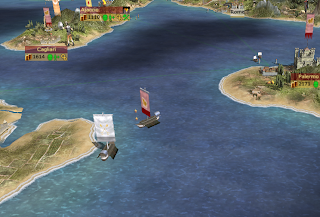 Suddenly, from the great city of Rome, comes a mighty fleet. My spies relay news of this unique occurrence in agitated voices. With ornately crafted and painted hulls gleaming in the sun and the masts transforming the sea into a forest, the grand papal army is loaded aboard in a great hurry. I send orders to the Genoese fleet to follow the Papal armada closely and not let them out of sight. “Where could they be going?”, I wonder. No crusade has been announced and the Pope doesn't have many enemies. The fleet steered south, towards the African desert landscape. At the tiny fortress of Tripoli, the army departs the ships and lay siege to, wait for it, the Sicilians. Despite having been the best of friends for a long time the Pope thought it prudent to prune the family tree of the Sicilians a bit and takes a trip to Tripoli to shorten the head of the residing crown prince. 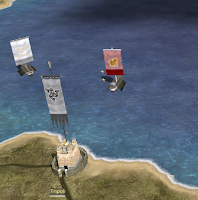 In an epic siege which, of course, the player does not get to see (in hindsight I should have put an army of my own next to it in order to participate since I was allied with the pope) the defending Sicilian army is obliderated and swallowed by the desert, never to be seen again. Speaking of mods: In the wake of writing this post I've started a game as the Holy Roman Empire using the mod “Lands to Conquer”. I'll be sure to make a couple of updates on that! By popular demand, the post will be updated to include images. It took a couple of days to dig out the old save files, but it can't be said that I don't care for my fans! Ok, ok: Fan. I only have one.